Earlier reports suggest differences in presentation between South Asians and white Europeans experiencing acute coronary syndromes. To compare the demographics and presentation of British South Asians, a long-term prospective survey of a consecutive series of British South Asians was conducted. South Asian patients were analysed as six distinct subgroups, with an overall comparison to a white European cohort. South Asian patients were of similar mean age, and male predominance (66%), across all subgroups, but as a whole, were younger (62 ± 13 years) than white Europeans (69 ± 14 years), p<0.001. Diabetes was markedly more prevalent in South Asians (range 42–55%) compared with white Europeans (17%), p<0.001. South Asians, as a whole, reported a larger average area of discomfort (5.2 ± 3.5) than did white Europeans (4.4 ± 3.1), p<0.001. Posterior chest discomfort was reported by 38% of all South Asians (range 35–44%) and by 25% of white Europeans, p<0.001. The average intensity of discomfort was similar between white Europeans (6.4 ± 3.2) and South Asian cohorts (6.4 ± 3.0), p=0.80. Differences in ‘intensity of discomfort’ between South Asian subgroups did not reach significance. Silent cardiac events were more common in white Europeans (12.7%) than in South Asians (9.0%), p<0.001. In conclusion, Asian patients were younger, more likely to be diabetic and tended to report discomfort over a greater area of their body, than did white Europeans. No differences were found between individual South Asian subgroups for pain distribution (extent), character or intensity. South Asian women tended to report a wider distribution of discomfort and intensity than did men across all subgroups. Some reports suggest that atypical presentations in patients suffering myocardial infarction have led to an increased risk of delays in South Asians seeking medical attention,9,10 particularly in women,11 resulting in less aggressive clinical management,12 and worse in-hospital mortality.13 More recently, two large studies have reported similar,4 or greater intervention rates,14 across all South Asian subgroups. We performed a 10-year prospective survey of several South Asian subgroups, presenting with acute coronary syndromes, to determine any differences in symptomology. Ethical approval was obtained through the National Research Ethics Service (reference 06/q0407/43) and all subjects gave written consent. Patients were asked to define their perceived ‘origins’. Subjects were given language assistance if required. All analyses examined the overall differences in outcomes between the six South Asian subgroups. The majority of outcomes were measured on a categorical scale; compared between groups using the Chi-squared or Fisher’s exact test. Two outcomes were measured on a continuous scale, using analysis of variance. Analysis was performed using STATA® software (version 12.1). Of 1,329 patients surveyed, 203 (15.3%), comprising 48 ‘Punjabi’ (24%), 38 ‘Indian’ (19%), 33 North Indian (16%), 22 South Indian (11%), 16 Mauritian (18%), 13 Christian Indians (6%) and 33 others (16%), were excluded. Exclusion was based on ‘too broad a descriptive term’ or ‘too small a group to analyse’. Demographics for the six subgroups (n=1,126) are shown in table 1. Overall, the South Asian cohort comprised a total of 747 men (66.3%) and 379 women. South Asians were of similar mean age, with a male majority (60–63%) over all subgroups. The white European cohort (n=2,301) had a similar male preponderance (62%), but was, on average, older at presentation (69 ± 14 years) than any South Asian subgroup (p<0.001). The prevalence of diabetes in white Europeans (17%) was less than half that of any South Asian subgroup (range 42–55%). Overall, there was a significant difference in the type of acute coronary syndrome between the two broad ethnic groups. Compared with white Europeans, South Asians had a higher proportion of ST-elevation events (38% vs. 21%, p<0.001) and a lower proportion of non-ST-elevation events (29% vs. 40%, p<0.001). Statistically, the proportion of white Europeans (table 2) experiencing anterior chest discomfort (1,975 of 2,301 – 86%) was marginally lower than in South Asians (1,007 of 1,126 – 89%), p=0.009, largely due to the large sample size. Posterior chest discomfort was reported by more than a third of all South Asians (423 of 1,126 – 38%, range 35–44%) and a smaller proportion of white Europeans (562 of 2,301 – 25%), p<0.001. Posterior chest discomfort was more widely reported by women than men for every South Asian subgroup and by white Europeans. South Asians, as a whole, reported a larger area of discomfort (5.2 ± 3.5) than did white Europeans (4.4 ± 3.1), p<0.001 (table 2). Every South Asian subgroup (figure 1A) reported a mean area of discomfort larger than did the white European cohort (figure 1B). 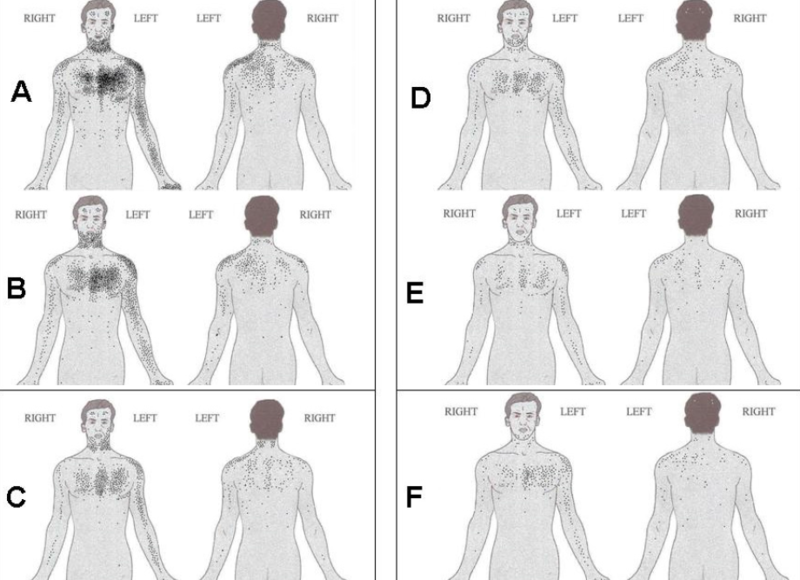 In South Asians (figure 2), the most common extra-thoracic locations for discomfort included arms (37%), neck (16%) and jaw (8%) (figure 3). 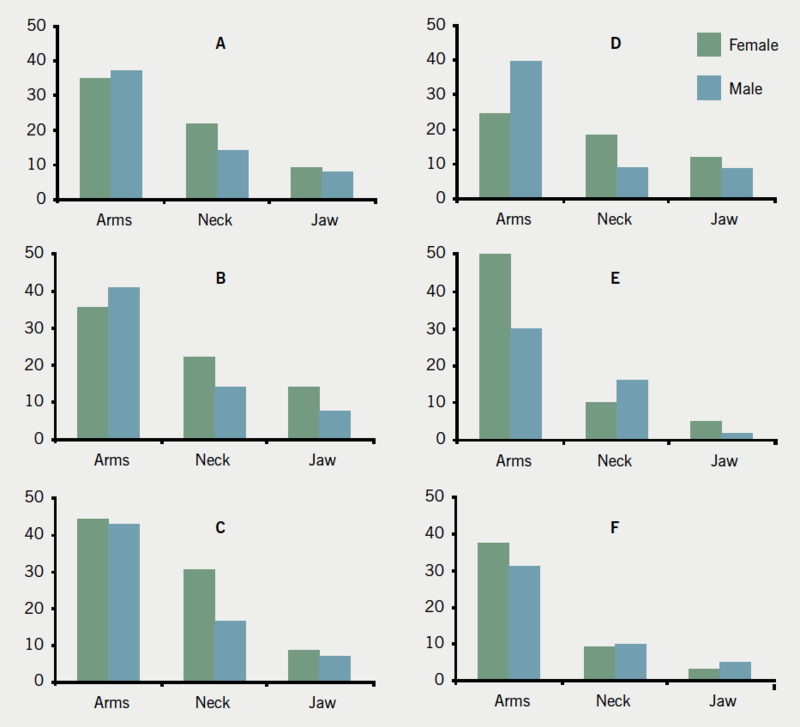 In white Europeans, the distribution was similar with values of 40% for arms, 14% for neck and 7% for jaw. Overall, silent cardiac events were more common in white Europeans (12.7%) than in South Asians (9.0%), p<0.001, despite a significantly higher proportion of South Asians being diabetic (58%) compared with the white Europeans (25%), p<0.001. More than 50% of individual South Asians experiencing silent events were diabetic. The average intensity of discomfort (mean ± standard deviation [SD]) was similar between white Europeans (6.4 ± 3.2) and South Asian cohorts (6.4 ± 3.0), p=0.80. Any differences for ‘intensity of discomfort’ observed between individual South Asian subgroups did not reach significance. A higher proportion of white Europeans (19.9%) than South Asians (18.8%) reported ‘maximum discomfort’, p=0.02. For South Asians, ‘weight’ was the most commonly used term for discomfort (29–47% of patients), followed by ‘squeeze’ (19–35%), ‘ache’ (14–25%), ‘burn’ (6–17%), ‘stabbing’ (4–13%) and ‘shooting’ (0–4%). White Europeans followed a similar trend although ‘ache’ was a more frequent choice than ‘squeeze’. Earlier work suggests South Asians report a greater frequency,15 intensity and area of discomfort than do white Europeans.6 Variations in risk factors,16-18 and an excess prevalence of coronary disease are previously described for South Asians.1,19 Most studies ‘position’ Bangladeshis, Pakistanis and Muslim Indians at a cardiovascular disadvantage to other South Asians,2,4 possibly with Bangladeshis having the worst risk profile.20 We postulated there might be variations in presentation within a population broadly encompassed as ‘South Asian’. As in earlier studies, we found South Asians to be younger than white Europeans and with an overall prevalence of diabetes,16,21 reaching 2.7 times greater than in white Europeans. High levels of diabetes are described in British Pakistanis (22.4%) and Bangladeshis (26.6%),19 although our cardiac selected patients far surpass these values (range 42–55%). We found that discomfort over the back of the chest was reported more frequently by each of the South Asian subgroups as compared with white Europeans. Discomfort limited exclusively to the back was unusual and similarly infrequent in South Asians (0.3%) and white Europeans (0.7%); a feature noteworthy with ‘differentials’ including aortic dissection. The study is limited by survivor bias. Language, and its nuances, may have influenced the choice of terms, although minimised by our use of images (figure 1). Furthermore, we accept that an ‘overlap’ of territories and religious affiliations has occurred. Some authors suggest ‘religious stratification’ might better determine coronary disease risk,37,38 but a perception and sensitivity to ‘Islamophobia’ prevented using this as a practical denominator in our study. This was not a genetic-based study. Individuals calling themselves ‘Pakistani’, as opposed to ‘Indian’, base this on their country of origin (formed as recently as 1947), a partition that is artificial and predominantly based on religious affiliation. Even more recently (1971), two countries on the Indian subcontinent were further split (creating the Islamic Republic of Pakistan and the Peoples Republic of Bangladesh). Our subgroups, including subjects identifying with the Gujurat State or Sikhism, have been in existence considerably longer (millennia and 500+ years, respectively). We suggest an association with a region State (Gujurat for example), with a distinct language, food, customs and ‘inter-marriage’ must surely be influential on behaviour, and potentially clinical presentation. We totally accept there is an overlap between any groupings and would argue this might also include commonly ascribed simple definition by nationality, which in one case has been in existence for only 43 years. Our observations reveal that South Asian patients are younger, more likely to be diabetic and tend to report a higher intensity of pain and over a greater area of their body, including over their backs, than do white Europeans. Differences between individual subgroups of South Asians were less obvious and possibly confounded by some overlap between these different groups. This study represents one of few studies,37,39 attempting to examine subgroup heterogeneity among South Asians in the UK. All authors have contributed to the writing and interpretation of these study data. 22. Lear JT, Lawrence IG, Pohl JEF, Burden AC. Myocardial infarction and thrombolysis: a comparison of the Indian and European populations on a coronary care unit. J R Coll Phys 1994;28:143–7. 27. Kyker KA, Limacher MC. Gender differences in the presentation and symptoms of coronary artery disease. Curr Womens Health Rep 2002;2:115–19. 36. Patel DJ, Winterbotham M, Sutherland SE, Britt RG, Keil JE, Sutton GC. Comparison of methods to assess coronary heart disease prevalence in South Asians. Nat Med J India 1997;10:210–13. 39. Nazroo JY. South Asian people and heart disease: an assessment of the importance of socioeconomic position. Ethn Dis 2001;11:401–11.